They can spot these skin care issues in an instant! Try as we might to fix our skin care woes on our own, experts can always tell what's really going on behind the scenes. With just a quick look at our skin, these gurus get a glimpse into our everyday habits, health and more, and can help us get back on the right track. “Dehydration in the form of dull, lackluster skin is immediately apparent and can be caused by poor diet, (lack of) sleep, excess alcohol and sun damage,” Edyta Jarosz, lead aesthetician at PFRANKMD Skin Salon, told TODAY Style. If your skin seems a bit dryer or puffier than usual, try cutting back on that nightly glass of red or your morning cup of joe. Both can dehydrate skin, explained Regine Berthelot, director of spa education at Caudalie. You can keep skin extra hydrated by layering products for maximum moisture (the order should be: serum, oil and then moisturizer). As the largest organ in the body, your skin is often the first to display proof of underlying health issues, such as an imbalanced diet. So if you’re loading up on high glycemic Index (GI) carbohydrates (think white bread and sugary drinks), for instance, you might be setting the stage for acne. These tasty treats are known to increase insulin levels, thereby causing inflammation and triggering acne, said Dr. David Lortscher, board-certified dermatologist and founder of Curology. Diets heavy in dairy — skim milk, in particular — can also trigger certain skin woes. “Dairy products have been shown to influence acne in some people by containing certain hormonal components that can stimulate oil production and lead to clogged pores and breakouts,” Lortscher added. If you’re worried that dairy products might be causing your acne, Lortscher recommends cutting out all dairy products (including whey/casein-containing products) for at least two weeks to see how your skin responds. If your skin seems a bit dull and dry, and it's suddenly lacking color, your lymphatic system might not be doing such a great job delivering nutrients. Puffiness can be a telltale sign of lymphatic issues, says Joanna Vargas, celebrity facialist and founder of Joanna Vargas Salons and Skincare Collection, who recommends daily facial massage to get the lymph moving properly. When your lymphatic system is on the fritz, fluids can build up in your tissues and cause swelling, called lymphedema, Lortscher explained. Depending on the cause of your lymph buildup, treatment options may include massage, dietary management and compression garments. Of course, not all puffiness automatically signals lymphatic issues, and a physician can help determine whether whether the situation is more complex. We’ve all been there: A massive monster of a pimple emerges just in time for our period to begin (so unfair!). Turns out, menstrual acne has a preferred sweet spot, too: the side of your chin. Cysts and bumps have a tendency to plant themselves in that sometimes painful position right when you’re about to start your menstrual cycle. “Prevent the flare up by placing a warm cotton pad on the area when you feel its first signs," Berthelot recommends. Or, apply an acne-fighting mask overnight for a long-lasting spot treatment. Skin can be more delicate than you think, so it's always a good idea to treat yours with kid gloves. That means avoiding certain inflammation triggers such as hot showers, excessive scrubbing, potentially irritating ingredients and overuse of skin care products, all of which can cause redness, acne and swelling. 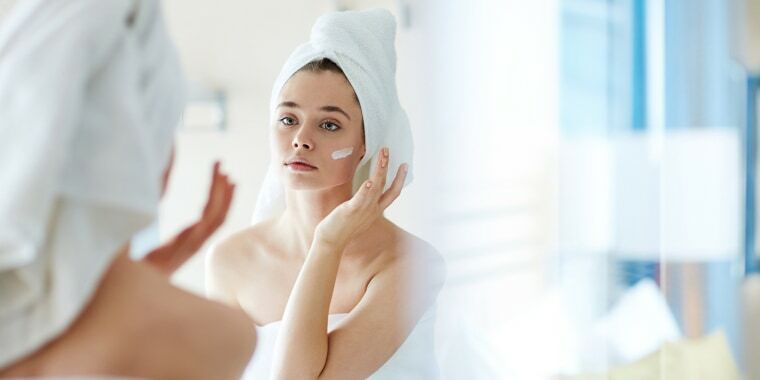 Certain skin care ingredients — benzoyl peroxide, sodium lauryl sulfate, retinoids and propylene glycol, to name a few — can irritate skin, so try avoiding them or at the very least, make sure you know the concentration of any active ingredients in the products you use. "The stronger the product, the more conservative you want to be in terms of amount applied and frequency of application," Lortscher said.